MODERATORS... hmm... how can I say... I need more space AGAIN... sorry... it reached the limit of 800 K... you can delete the previous edits... It will get much better, I promise! you could stop now and this would still be magnificent. Can't wait to see the final version. This is really a great drawing, Pix. One of my favorite subjects to draw. I hope they give you more time to finish it. I really like how you just use lines to create such nice volumn on the drawing! what determines the amount of space a piece is using? ive seen some amazing pics with not even 500k used up and then my bird piece was through the roof. is it so many edits, strokes, color, techinique, layers..what? I believe going over the amount of space given is because of the amount of edits. It's not really wise to save 10 minute bits anyway. *huggles the tiger* CUTE!!!!! *gets hand bitten off* . Very good too! i think he needs to finish the right section of the draw. ooh, PIX ;). This is coming a long very nicely. He almost looks velvet. Are you going to be able to finish him? He is just stunning the way he is right now, anyway. I have a tiger tattoo on my chest. I only wish it was this good...I only wish I was this good...what I'm trying to say is, this is damn good! Well, I intend to finish it... as long as they grant me enough space... The reason I don't let it open in my computer till it is finished is that I have already lost 2 edits of almost 2 hours due to electric power outage. I live in Brazil (and I am brazilian) and unfortunately my UPS is not working anymore. I think the "unfinished" area compliments he detail of the finished work by making it pop, it also helps the viewer see what wonderful detail there really is, also gives it a painterly quality. i agree with axil...though if you want to finish it that would be fine, this is really great! Hi Pix. that is an amazing picture. Very amazing. I can't believe how it started as those scribbly hair lines and now turns into this wonderful work. good..uhm..tiger. what can i say? after nine hours and 7 edits it should jump out and bite my head off..and stuff. Wow, lovely. Looks like my fat orange tabby. This one is good except for the bottom left hand corner......there's a very sudden change in contrast of colors which makes it look a bit unreal^^;. Smooth as all hell, level of realism is obviously hard to distinguish from a photo. Reminds me of that one movie company MGM with the roaring lion. Of course this is a tiger... hrm. Wow... the detail, color, everything... all amazing. this is crazy....you are crazy! I love your works, really...what format do you use I must know? Tablet? Mouse? i can only say WOW!!! very very GOOD!@! This is soooo good! And Cute! :3 I'm lovin' the fur. Wow, this tiger is so beautiful... (makes me think of TI-double-G-er. lol You did an awesome job. I hope you draw some more... um... tigers! Almost real! SO CUTE!! I love the fur! Awesome work, pix! O.O Holy shi-er-Crap! This is REALLY good, I love how you did the details! the fact that you did this all in solids is absolutely amazing. 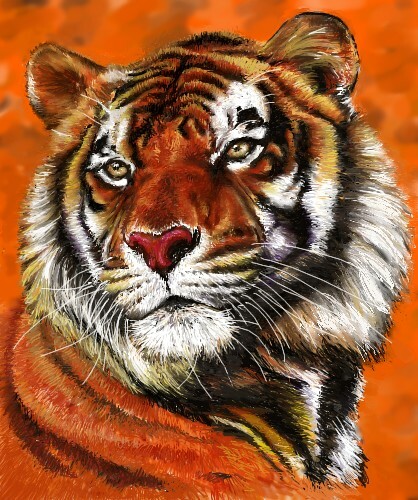 i luv ur tiger drawing. is v good. It doesn't look like you did it in a computer, more like actual canvas... or something. i love this, excellent work. wonderful- its so sad these animals may soon be extinct! Where do these great artists go? Are they so Elite that they disappear into another realm? Get abducted by Aliens for their Eliteness? beautiful tiger! keep up the good work.